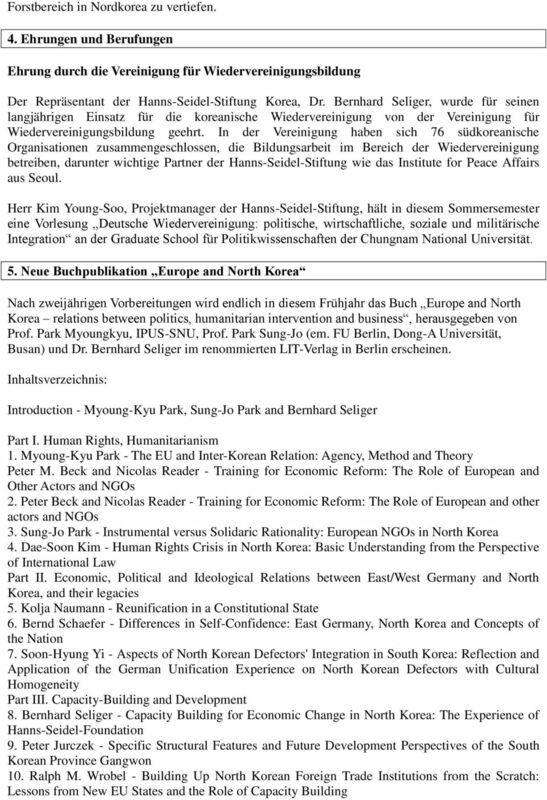 Download "Neuigkeiten aus der Hanns-Seidel-Stiftung, Büro Korea – Maerz 2010"
6 11. 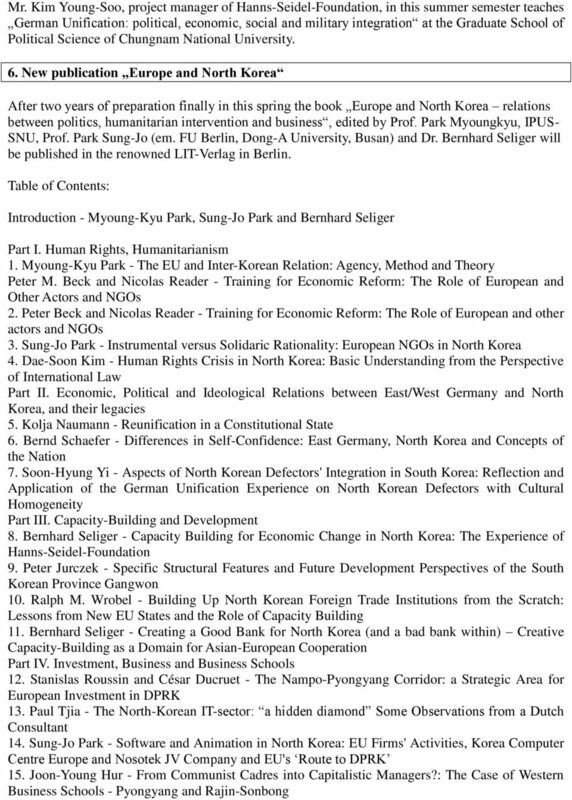 Bernhard Seliger - Creating a Good Bank for North Korea (and a bad bank within) Creative Capacity-Building as a Domain for Asian-European Cooperation Part IV. Investment, Business and Business Schools 12. 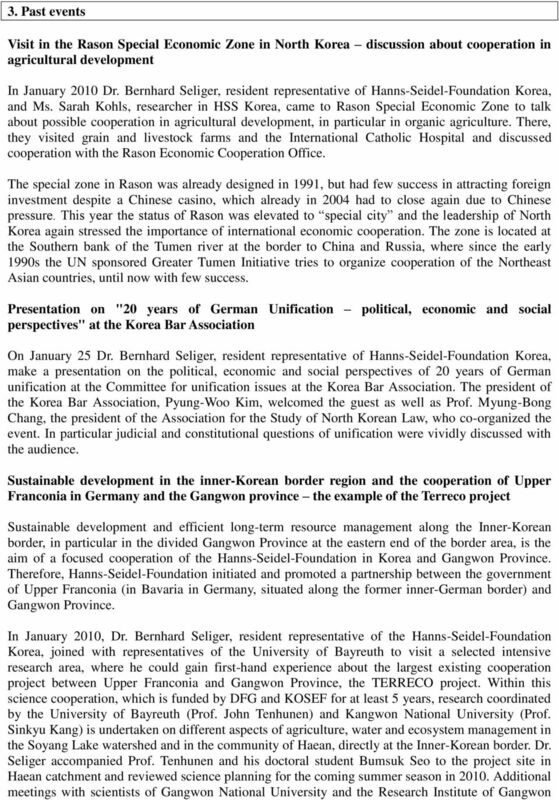 Stanislas Roussin and César Ducruet - The Nampo-Pyongyang Corridor: a Strategic Area for European Investment in DPRK 13. Paul Tjia - The North-Korean IT-sector: a hidden diamond Some Observations from a Dutch Consultant 14. 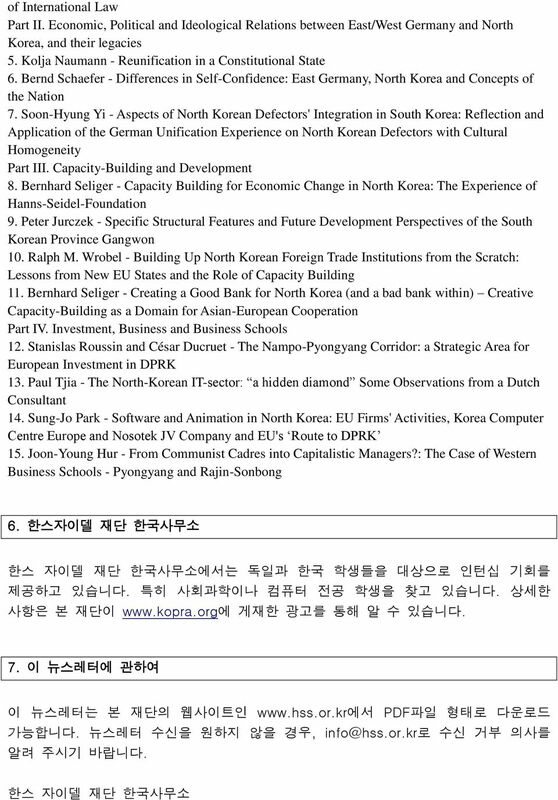 Sung-Jo Park - Software and Animation in North Korea: EU Firms' Activities, Korea Computer Centre Europe and Nosotek JV Company and EU's Route to DPRK 15. Joon-Young Hur - From Communist Cadres into Capitalistic Managers? 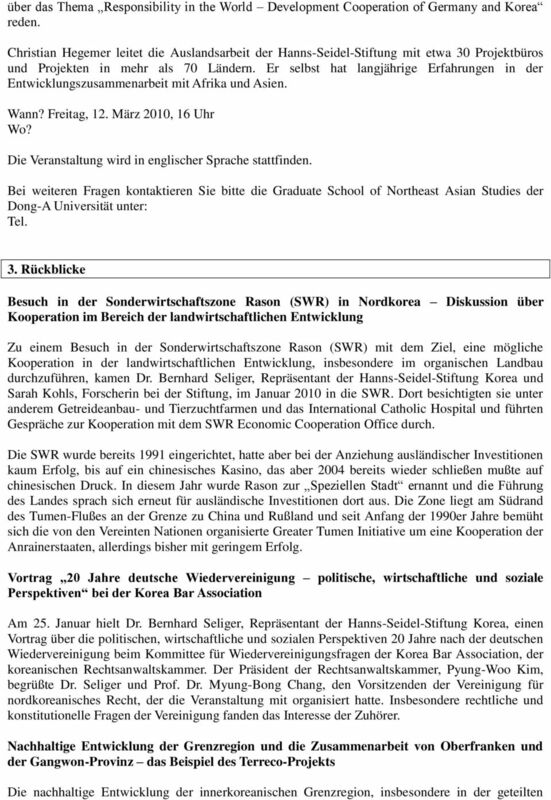 : The Case of Western Business Schools - Pyongyang and Rajin-Sonbong 6. 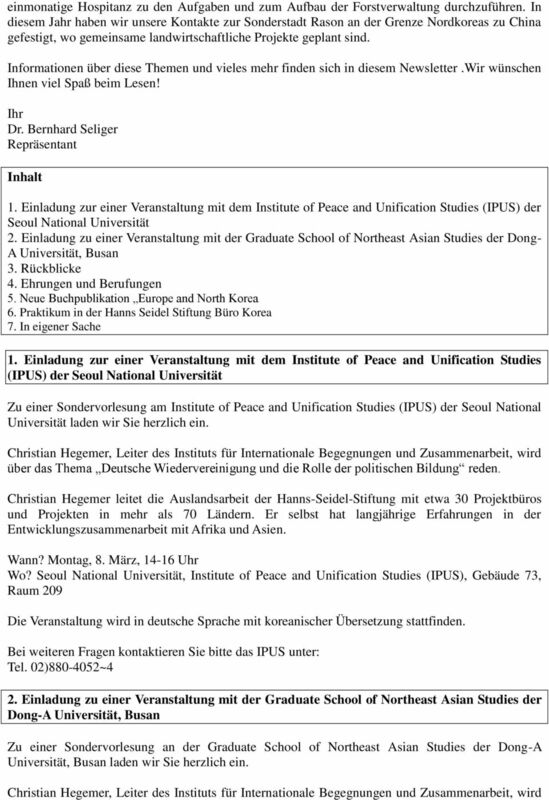 Praktikum in der Hanns Seidel Stiftung Büro Korea Das Büro der Hanns Seidel Stiftung in Seoul bietet regelmäßig Praktika für koreanische und deutsche Studenten an. Mehr Informationen finden sich in der Anzeige der Hanns-Seidel-Stiftung unter 7. In eigener Sache Dieses Newsletter kann auch als PDF von der Internet-Seite heruntergeladen werden. 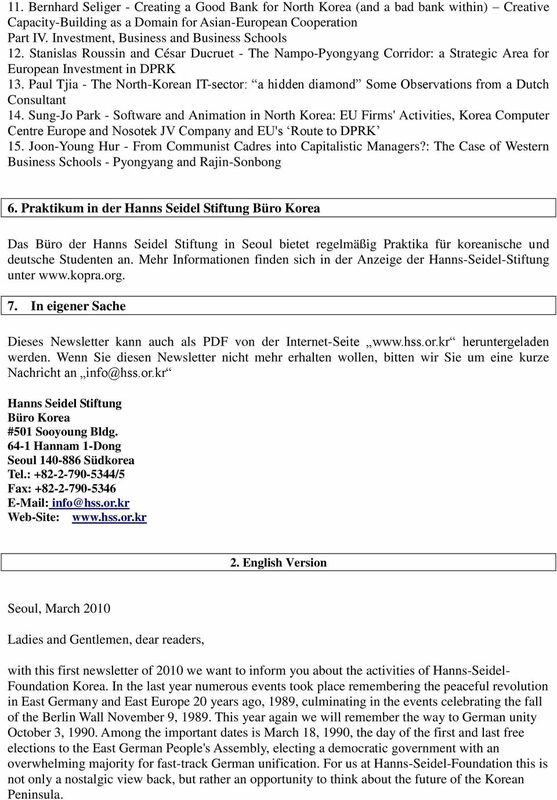 Wenn Sie diesen Newsletter nicht mehr erhalten wollen, bitten wir Sie um eine kurze Nachricht an Hanns Seidel Stiftung Büro Korea #501 Sooyoung Bldg Hannam 1-Dong Seoul Südkorea Tel. : /5 Fax: Web-Site: 2. 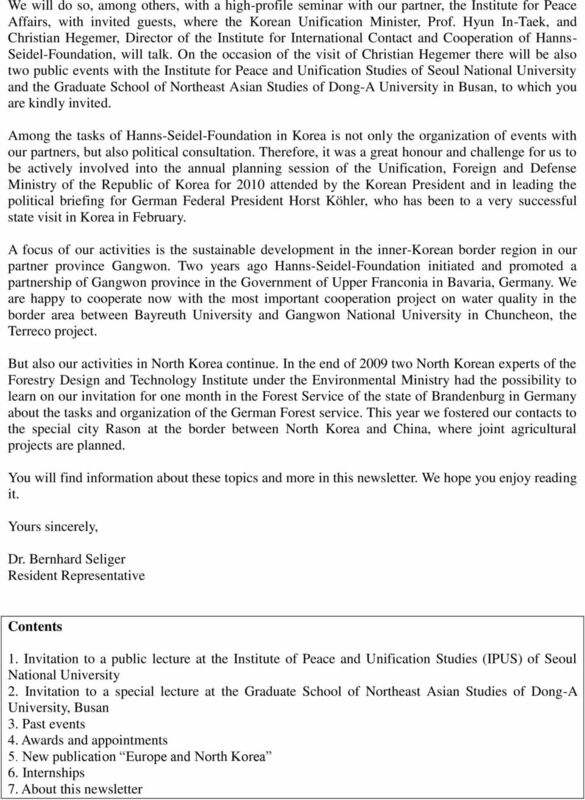 English Version Seoul, March 2010 Ladies and Gentlemen, dear readers, with this first newsletter of 2010 we want to inform you about the activities of Hanns-Seidel- Foundation Korea. In the last year numerous events took place remembering the peaceful revolution in East Germany and East Europe 20 years ago, 1989, culminating in the events celebrating the fall of the Berlin Wall November 9, This year again we will remember the way to German unity October 3, Among the important dates is March 18, 1990, the day of the first and last free elections to the East German People's Assembly, electing a democratic government with an overwhelming majority for fast-track German unification. 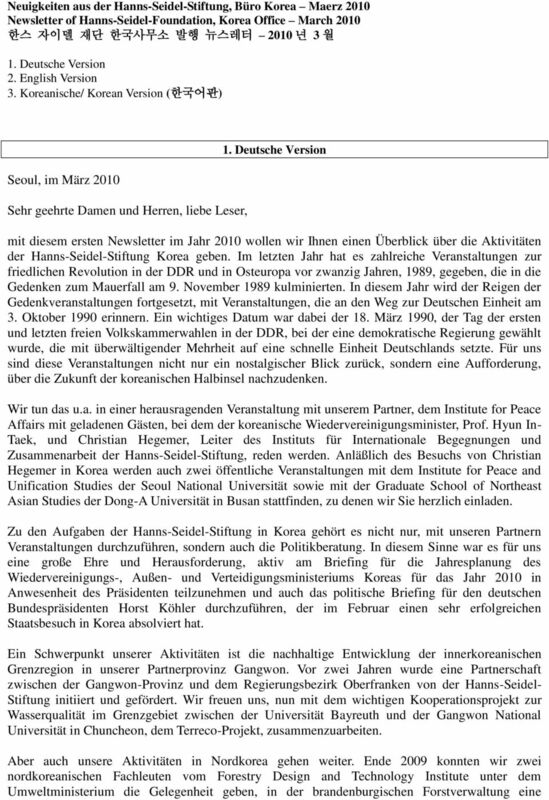 For us at Hanns-Seidel-Foundation this is not only a nostalgic view back, but rather an opportunity to think about the future of the Korean Peninsula. 10 (partners of Hanns-Seidel-Foundation) were held. Within TERRECO, German and Korean scientists and doctoral students work together to analyze the economic costs and benefits of highland agriculture in the context of related costs with respect to water quality in the border region. Soyang Lake in the mountainous Gangwon Province is the largest reservoir of water in Korea, contributing to supplies for downstream urban areas. The TERRECO project provides a solid longterm base for expanding scientific exchange between Upper Franconia and Gangwon Province on themes related to resource management under the influences of land use and climate change. In this context, Korea is subjected to slowly occurring temperature increases that appear much stronger than the global average. The field visit to Haean also provided for discussions of contrasting management in the border area, stimulated by a visit to the Uelgi Observatory directly at the DMZ, where TERRECO is measuring climate data with mobile weather stations. During this year, additional joint workshop activities on the development of the border area, in particular related to environmental mediation, are planned in cooperation with the project partners, the Research Institute of Gangwon and Kangwon National University. 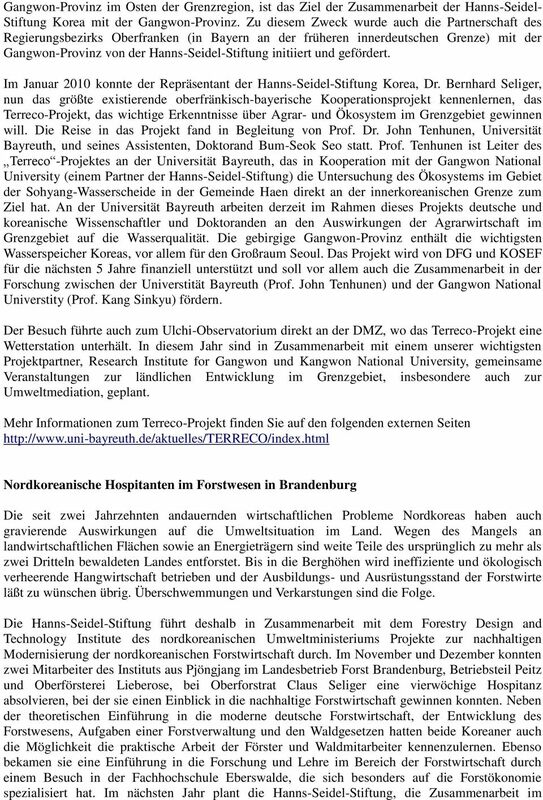 More information on the Terreco project can be found at North Korean Forestry Internships in Brandenburg Since two decades North Korea suffers of economic problems and these problems have grave consequences for the environment of the country, too. Due to a lack of arable land and energy large parts of the forests that formerly covered to more than two thirds of the country disappeared. On sloping lands up to the top of mountains inefficient and ecologically disastrous agriculture exists and the level of training and equipment of foresters is poor. Flooding and karst formation are resulting of the ecological catastrophe. Hanns-Seidel-Foundation together with the Forestry Design and Technology Institute (FDTI) of the North Korean Ministry of Land and Enviroment Planning cooperate in projects of sustainable modernization of North Korean forestry. In November and December 2009 two employees of the FDTI from Pyongyang got a training in the State office Forest Brandenburg,unit Peitz and Forestry office Lieberose, overseen by Claus Seliger, office chief. Here they got an insight into sustainable forestry. Besides a theoretical introduction to modern German forestry, the development of forestry, tasks of the forest offices and forestry laws they had the possibility to learn about practical work of foresters and woodworkers. 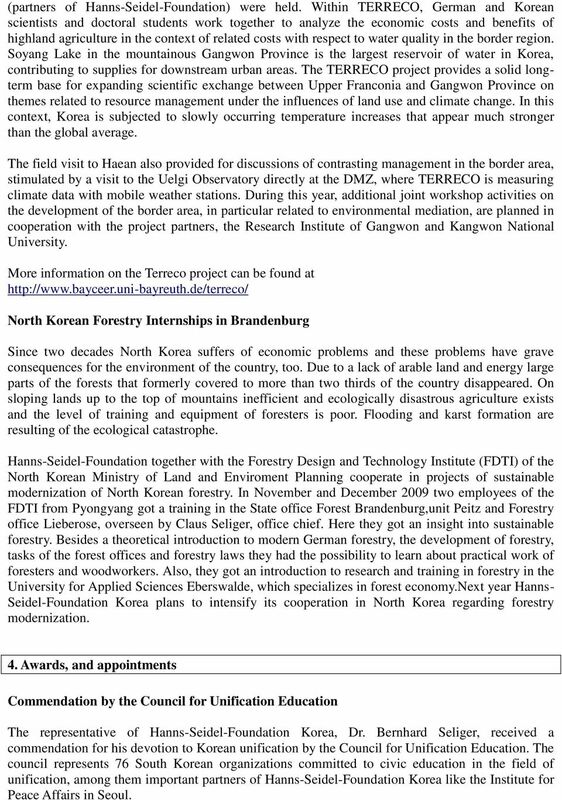 Also, they got an introduction to research and training in forestry in the University for Applied Sciences Eberswalde, which specializes in forest economy.next year Hanns- Seidel-Foundation Korea plans to intensify its cooperation in North Korea regarding forestry modernization. 4. 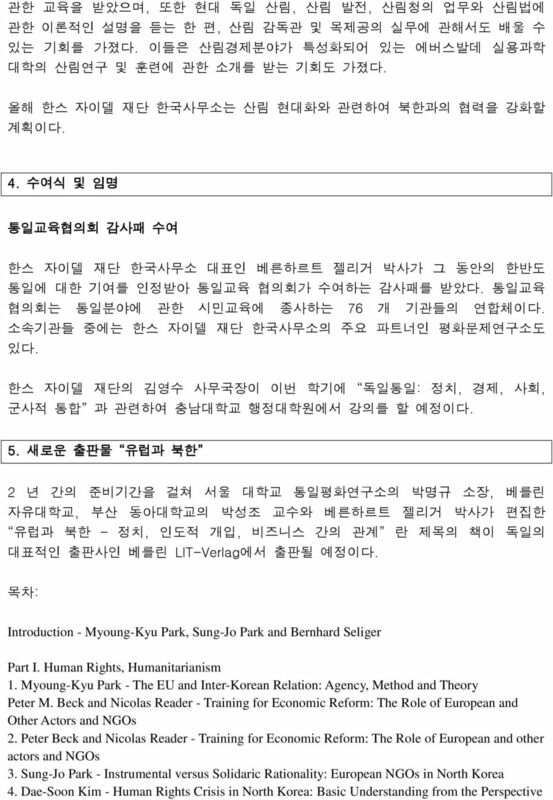 Awards, and appointments Commendation by the Council for Unification Education The representative of Hanns-Seidel-Foundation Korea, Dr. Bernhard Seliger, received a commendation for his devotion to Korean unification by the Council for Unification Education. The council represents 76 South Korean organizations committed to civic education in the field of unification, among them important partners of Hanns-Seidel-Foundation Korea like the Institute for Peace Affairs in Seoul. 12 6. Internship at Hanns Seidel Foundation, Office Korea Hanns Seidel Foundation in Seoul offers regularly internship places for young Korean and German students. We especially offer internships for students of social sciences and computing. 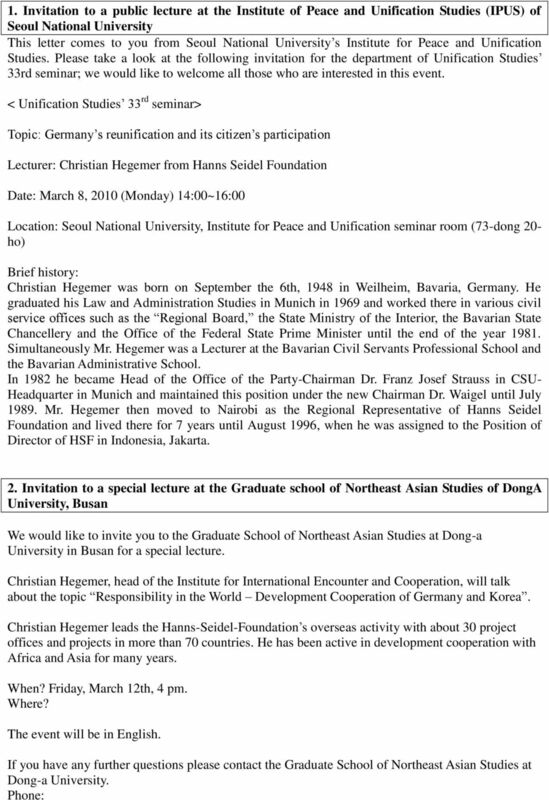 For more information see the advertisement of Hanns Seidel Foundation Korea in 7. 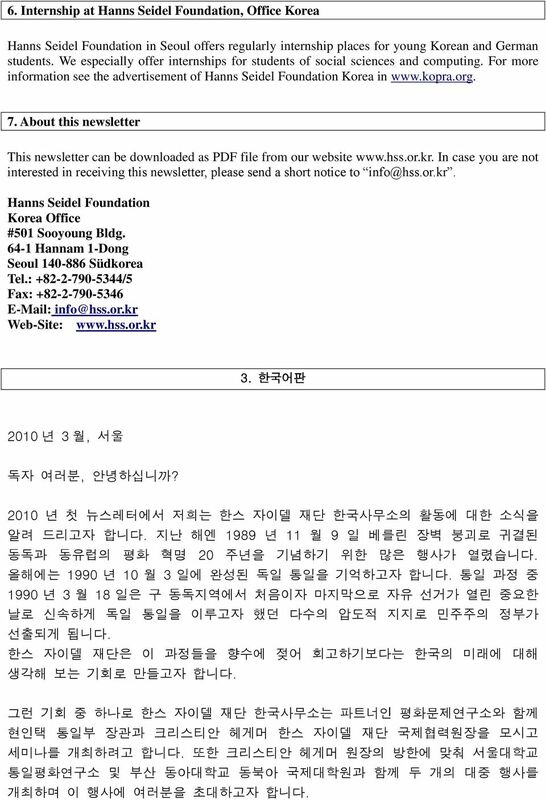 About this newsletter This newsletter can be downloaded as PDF file from our website In case you are not interested in receiving this newsletter, please send a short notice to Hanns Seidel Foundation Korea Office #501 Sooyoung Bldg Hannam 1-Dong Seoul Südkorea Tel. : /5 Fax: Web-Site: 3. 한국어판 2010 년 3 월, 서울 독자 여러분, 안녕하십니까? 2010 년 첫 뉴스레터에서 저희는 한스 자이델 재단 한국사무소의 활동에 대한 소식을 알려 드리고자 합니다. 지난 해엔 1989 년 11 월 9 일 베를린 장벽 붕괴로 귀결된 동독과 동유럽의 평화 혁명 20 주년을 기념하기 위한 많은 행사가 열렸습니다. 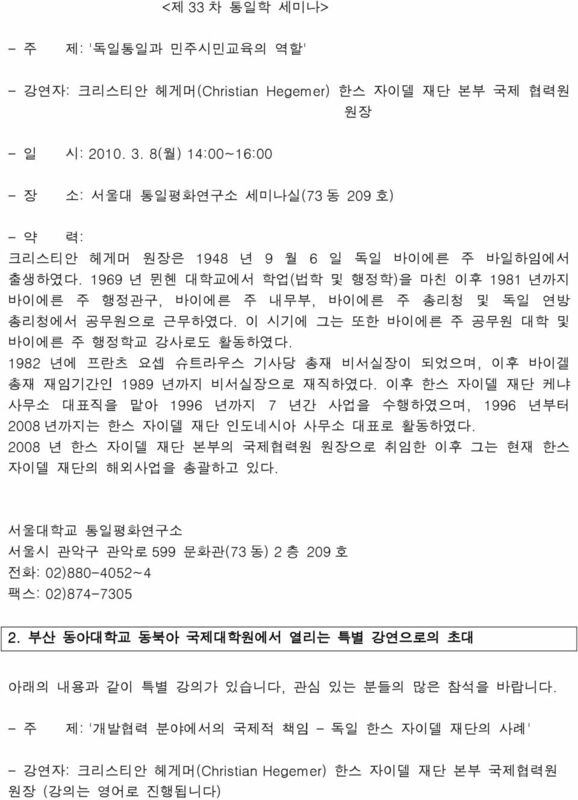 올해에는 1990 년 10 월 3 일에 완성된 독일 통일을 기억하고자 합니다. 통일 과정 중 1990 년 3 월 18 일은 구 동독지역에서 처음이자 마지막으로 자유 선거가 열린 중요한 날로 신속하게 독일 통일을 이루고자 했던 다수의 압도적 지지로 민주주의 정부가 선출되게 됩니다. 한스 자이델 재단은 이 과정들을 향수에 젖어 회고하기보다는 한국의 미래에 대해 생각해 보는 기회로 만들고자 합니다. 그런 기회 중 하나로 한스 자이델 재단 한국사무소는 파트너인 평화문제연구소와 함께 현인택 통일부 장관과 크리스티안 헤게머 한스 자이델 재단 국제협력원장을 모시고 세미나를 개최하려고 합니다. 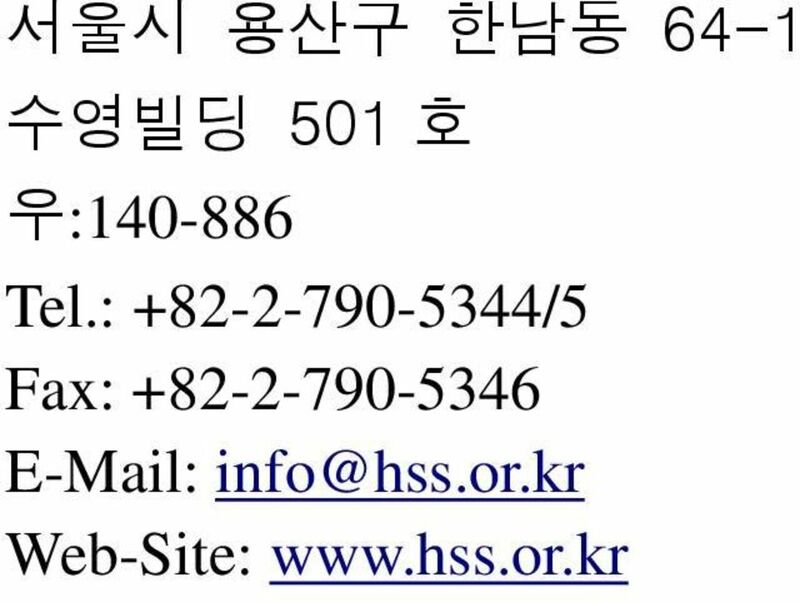 또한 크리스티안 헤게머 원장의 방한에 맞춰 서울대학교 통일평화연구소 및 부산 동아대학교 동북아 국제대학원과 함께 두 개의 대중 행사를 개최하며 이 행사에 여러분을 초대하고자 합니다. 13 한스 자이델 재단 한국사무소의 활동 중엔 파트너와의 행사 개최뿐만 아니라 정치 고문으로서의 활동도 있습니다. 이에 따라 이명박 대통령이 참석한 2010 년도 외교 및 통일 안보분야 연두업무보고에 참석하는 명예와 기회를 갖게 됐습니다. 또 2 월 공식 방한을 성공적으로 마친 호르스트 쾰러 독일 연방 대통령을 위해 한국 정치에 관한 브리핑을 열기도 했습니다. 주요 재단 활동들 중 하나로 파트너 기관인 강원도 내 접경지역에서의 지속 가능한 발전을 들 수 있습니다. 2 년 전 한스 자이델 재단은 독일 바이에른 주의 오버프랑켄 행정관구와 강원도 간의 협력관계를 제안하고 현실화시켰습니다. 또한 저희 재단은 강원대학교와 바이로이트 대학이 함께 강원도 접경지역의 수질에 관한 중요한 공동 프로젝트인 테레코 프로젝트에 함께 일하게 된 것을 기쁘게 생각합니다. 북한 관련 프로젝트도 계속 진행됩니다 년 말에 저희 재단의 초청으로 북한의 환경성 산하 산림계획기술원의 전문가 두 명이 한 달 간 독일 브란덴부르크주의 산림청에서 독일 산림 서비스의 업무와 조직에 대해 배울 수 있는 기회를 가졌습니다. 올해 저희는 중국과의 국경 가까이에 위치한 북한의 나선 특별시에서 공동 농업 프로젝트를 계획하고 있으며 이 프로젝트의 실행을 위해 노력하고 있습니다. 독자 여러분께서는 상기 주제와 관련된 정보 및 추가적인 소식들을 저희 뉴스레터를 통해 얻으실 수 있습니다. 저희 뉴스레터가 도움이 되기를 바랍니다. 베른하르트 젤리거 드림 (한스 자이델 재단 한국사무소 대표) 목차 1. 서울대학교 통일평화연구소에서 열리는 대중 강연으로의 초대 2. 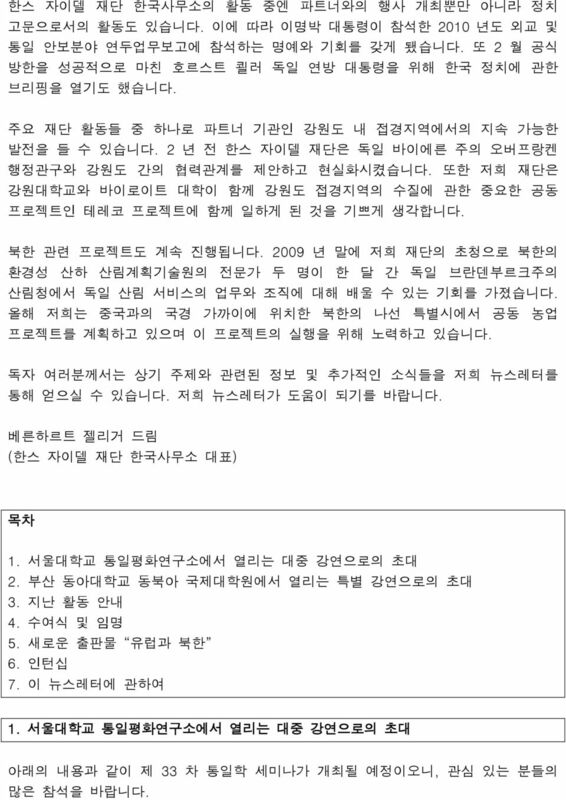 부산 동아대학교 동북아 국제대학원에서 열리는 특별 강연으로의 초대 3. 지난 활동 안내 4. 수여식 및 임명 5. 새로운 출판물 유럽과 북한 6. 인턴십 7. 이 뉴스레터에 관하여 1. 서울대학교 통일평화연구소에서 열리는 대중 강연으로의 초대 아래의 내용과 같이 제 33 차 통일학 세미나가 개최될 예정이오니, 관심 있는 분들의 많은 참석을 바랍니다.